This eleven page bagatelle is actually Anthony Powell’s fourth book, but is certainly more sought after by Powell fanatics than his first. Only 100 copies were printed for the author on the occasion of his marriage ( some say engagement ) to Lady Violet Pakenham . The squib, a pastiche of Augustan satire was aimed at the rise of the Scottish presence in British life, which for me goes back to the liking for things Caledonian that began with the Waverley novels and Blackwood’s Noctes Ambrosiana in the Regency period and continued through the reign of Queen Victoria ( think Balmoral, Our Life in the Highlands, the gamekeeper Brown etc ) and only waned a little at the end of the Edwardian era. Powell confessed that he had no quarrel with the Scottish and only saw them in the light of his Englishness and Welshness. Caledonia contains twelve lines on Scottish music by Powell’s friend Constant Lambert and there is an illustration by the mildly cultish Edward Burra, who was little known at that time. The book was printed to be given away to friends (did Powell have 100 friends in 1934 ? ) and some of the most coveted copies today bear inscriptions to them. For instance, for a mere $4,128 R.A. Gekoski will gladly sell you a copy inscribed by Powell to Mr David Talbot Rice, Gent. Professor in Art of the University of Edinburgh, who was, like Powell, an old Etonian. The faux eighteenth century style of address chimed in perfectly with the pastiche, but it also turned out to be prescient. Talbot Rice, like many an eighteenth century academic at Oxbridge or the Scottish Universities, managed to remain in post for 38 years, a feat unimaginable in our day of peripatetic academics. Alternatively, for a staggering £7,500 Peter Harrington will be delighted to sell you the copy of Caledonia bought at a Dominic Winter sale for £1,550. Inscribed bizarrely ‘Feb 16th 1930’ to Wyndham Lloyd, who was apparently a physician and wrote A Hundred Years of Medicine. According to the Powellites, Powell was not a snob and his obsession with his own genealogy and that of his friends had more to do with his fascination with 'characters' in history. His friendship with Lloyd and his brother may be connected to his interest in his own Welsh ancestry. Powellites with smaller pockets might have to pay around $3,000 for a plain copy, though the one available at this price in the USA does have six holograph corrections in Powell’s hand. Presumably, the rest of the edition has these too. It would seem that Powell retained the bulk of the remaining himself, so a few unadorned examples may have been skulking in his library at his death. One wonders what happened to these. Luckily, for those who just want to read the text, the Anthony Powell Society will sell to members for just £8 a facsimile of Caledonia published in 2011 by the Greville Press, complete with tartan covers but with an additional portrait of the author after Henry Lamb, Powell’s brother in law. Non-members can find copies of the same book for around $20 on the Net. Those with even less money to spare will find the complete text in Kingsley Amis’s Oxford Anthology of Light Verse . Because Caledonia is such an insubstantial book it could easily be overlooked at book sales and end up sold alongside less distinguished slim volumes or pamphlets. It is certainly worth looking out for. A price tag of £3,000 for eleven pages must be some sort of minor record for a modern first. Many thanks Robin. Et tu Healey! 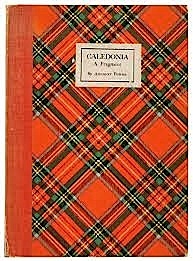 I saw a copy of Caledonia on the memorable house call we did at V.S. Naipaul's country cottage. Among many other things we bought a bunch of books inscribed to him by Paul Theroux and Theroux got into such a bate that he wrote a book about it. Naipaul had a Caledonia inscribed to him by his pal Powell - that he wasn't selling. He did imply that Powell still had a few left which might explain the bit about 100 friends. So fun. Wish these postings were more frequent. Powell as in Pole? Or Powell as in "Bowel"? He gave a copy to George Orwell, who said "I am glad to see you make a point of referring to them as 'Scotchmen', not 'Scotsmen' as they like to be called. I find this a good easy way of annoying them." Anyone know what became of that one? This is really good finding. I like such books and but I wonder why is it so expensive?! According to edubirdie review powellites with smaller pockets might have to pay around $3,000 for a plain copy, though the one available at this price in the USA does have six holograph corrections in Powell’s hand. Presumably, the rest of the edition has these too. Is this right information?